While we occupy the pages of the same newspaper, Wednesday night was a first. Bill (Yee) met Phil (Shigekuni), George Johnston (Into the Next Stage) and Sharon Yamato (Through the Fire) carpooled to our office at Third and Alameda, and I got to say hello to fellow cartoonist David Monkawa (Edges of the Pacific). 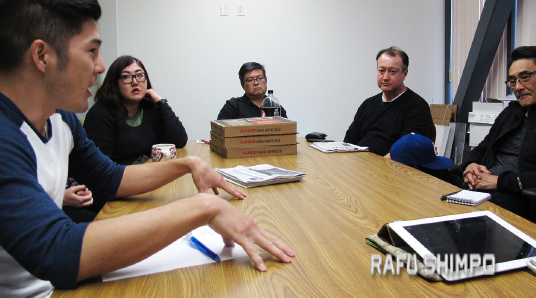 The reason for the meeting was the lead story in last Saturday’s Rafu Shimpo: the fate of the newspaper itself. In case you missed it, the newspaper has nine months to turn its financial fortunes around or it will close. This talented group of writers, and those who weren’t able to attend, will no doubt be commenting in their columns on what is next for The Rafu. George Johnston on Thursday called this Rafu’s “existential to-be-or-not-to-be moment” and that couldn’t be more true. But it is not enough to just “be.” For Rafu or any other Japanese American organization to truly thrive, it has to be willing to change. From what we are hearing, there is widespread support for The Rafu and also criticism of past mistakes and acknowledgement that the current model is not built to sustain itself in the long run. We exist in a bubble here, so it was good to hear the reaction of those outside of our office. “Everyone is really upset!” said Yamato. Monkawa put it in stark terms. “It’s a drive to save the community,” he emphasized, likening losing Rafu to Alzheimer’s for the JA community. The prevailing sense was that Rafu needs to specifically ask folks to do something: tell friends to subscribe, buy eNewspaper subscriptions, volunteer at booths at Obons in the summertime. All I can say now is stay tuned, you’ll definitely be hearing more from us. This small meeting was just the start of what must be efforts by Rafu to reach out to whoever is interested in helping. With that outreach must come transparency on the part of Rafu itself. I think publisher Mickey Komai releasing the extent of the financial deficit, first to the newspaper’s staff and then at the Little Tokyo Community Council, was the first, necessary step on this 10,000-subscriber campaign. Leading this effort is Jordan Ikeda, former sports editor and now digital marketing media and sales specialist. He has returned with a clear vision of what is needed internally for Rafu to survive and also with the perspective of a 33-year-old Yonsei who wants to see this institution continue for the next generation. It reminds me of the clarity of Craig Ishii, Sen Sugano, Kristin Fukushima, Mickie Okamoto and Stacey Toyota, who saw the need in the JA community for youth leadership development that was created by and for young leaders. Kizuna is celebrating its fifth anniversary with a gala dinner on May 7 at the Hyatt Regency Long Beach (shameless plug!). They could have abandoned the community for the private sector (as, let’s face it, a lot of Sansei did) but they chose to stake their futures right here in Little Tokyo. For 113 years, Rafu Shimpo has done the same. It will take the effort of an entire community to see it to its 114th and beyond. Everyone knows that old cliché, but I think we sometimes forget that. Even as Keiro/Kei Ai/Koreisha continues to simmer, exposing historic, unprecedented rifts in the Japanese American community, I can think of a few times when it has happened before. George Yoshinaga and Frank Emi stood on opposite sides of the debate on the Heart Mountain draft resisters. In the pages of this publication, they duked it out. Horse continually egging on the resisters, calling them “draft dodgers,” Frank and others standing up and defending the honor behind their actions of so many years before. Both men have passed now, but that fight and the larger issues it revealed shaped this community in many ways. Here in Little Tokyo two sides of an argument are forever on display at the Go For Broke Monument and the Japanese American National War Memorial Court at the JACCC. My memory of that time back in the ’90s is fuzzy, so I spoke with Min Tonai, a Korean War veteran and at that time the chair of the JACCC board. “The feelings got so bad, nobody wanted to listen to anybody,” Min recalled. Men of honor on both sides: Col. Young Oak Kim of Go For Broke and, if my memory is correct, Harold Harada, a dentist and 442nd veteran, had differing views on the way Nisei World War II veterans should be memorialized. Col. Kim had a vision of creating what would become the Go For Broke National Education Center. As Min explained, he and others wanted a memorial that listed all of the Japanese Americans who fought during World War II to show the American public how many bravely served. 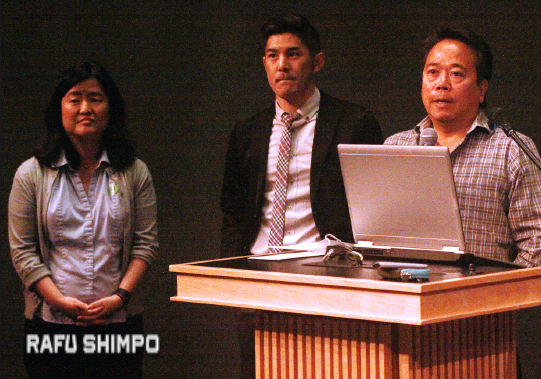 Harada’s group had a different intent: to honor the soldiers who made the ultimate sacrifice. This monument continues to add names to its honor roll. Among the most recent, Sgt. Paul Tokuzo Nakamura, a 21-year-old medic, who was killed in Iraq in 2003. Sadly, as long as there is conflict in the world, this monument may continue to expand. With stewardship of the monument transitioning from the Korean War veterans to Vietnam vets such as Ken Hayashi, it is comforting to know that this vital mission is in good hands. Gwen Muranaka, English editor-in-chief of The Rafu Shimpo, can be contacted at [email protected] expressed are not necessarily those of The Rafu Shimpo. Sad Ending- the plight of the Rafu Shimpo. The problem is that American society has been doing what people think is right: providing citizen with individual freedom to achieve success and status on the basis of their capacity, unencumbered by ancestral background. First sign of the decline were the J-towns fading away; then the decline of churches and social groups including senior citizens housing like Keiro housing, and now the demise of the final Nikkei newspaper. This kind of identity crises brought on by internment experience, the pressure to migrate to America, which is today more threatening than ever to the remaining Nikkei. The dissolution of Nikkei is not situated at some point in hypothetical future. The process is taking place before our eyes. The problem with regard to continuity exist for virtually every ethnic group in American society. Our ethnic group that seemed so distinct in 1941 has almost completely faded away. Three-quarters of those born since 1960 have married outside of Nikkei group; the American melting pot continues to bubble. While ethnic separatism in the open American society is not possible, what is possible is the transmission of Japanese culture. Part of the concern for cultural continuity confronting the Nikkei is similar to that which other group have faced. Nikkei culture in the sense of scholarship is almost now gone from academic studies. The universities, like UC-Berkeley have left the “railroads and barbed wire” studies and moved to other Asian American cultures. Given the history of freedom and equality, why are leaders and writers troubled about the future of Japanese American press? The erosion of our identity is mainly a natural product of living in a multicultural pluralistic America. A great many Nisei are nostalgic for the world, their lost paradise, and the comfortable closed society from which they were not so much liberated as expelled to the concentration camps. The Nikkei of America now faces similar destiny. Slowly but surely, they are fading away. Soon nothing will be left save a paper copy of the Rafu Shimpo and a camp made jar of home brewed.